I told you a couple weeks ago that I was going to do a full review of my latest reads because they need to be on your Summer reading list. If you haven't checked out my review of A Man Called Ove then just stop what you're doing now and click here. Now onto another recent read - and probably my favorite of the bunch; Left to Tell: Discovering God Amidst the Rwandan Holocaust by Immaculee Ilibagiza. To put it lightly I couldn't put this book down. To be more honest, I put cartoons on for a solid 48 hours because it was so captivating I couldn't have my kids running around and disturbing my reading time. Bad mom moment - I know. I read it in its entirety within a 48-hour period and I didn't want it to end. Left to Tell: Discovering God Amidst the Rwandan Holocaust is a true story rooted in faith and told from the real-life perspective of a Rwandan Holocaust survivor. While it is technically a faith-based book it reads like a non-fiction novel and it certainly doesn't come across churchy or like it's trying to win over new converts, so it's a great read for both the secular and nonsecular reader. It tells a very devastating story of a young woman's personal experience and how she believes her faith in Christ was her sole reason for survival. She believes that her life was spared so that she could share her story, hence this beautiful book. 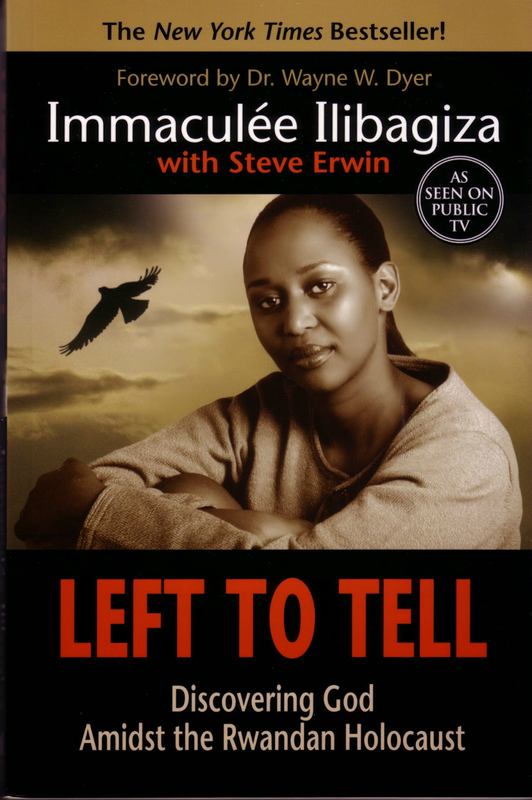 During the Rwandan Holocaust the author, Immaculee, spent weeks confined to a small bathroom with seven other women. Afraid for their lives and cut off from the world, they lived in fear that at any moment they too would fall victim to the senseless, hateful crimes and murders that happened to Tutsi across Rwanda in 1996. The Holocaust was caused due to decades of ethnic unrest between the Tutsi and the Hutu climaxing in a bloody war that left families and a country torn apart. Hundreds of thousands of Rwandans were killed, among them was Immaculee's family. Could you forgive the people who brutally murdered and killed your family, those who ridiculed them and taunted them in their last moments? Immaculee finds forgiveness in her heart and her story is so powerful it will make you question any unrest in your own. It will make you examine your soul and find new ways to let the light of forgiveness start to radiate. This is one of the best books I've EVER read and I highly recommend that you take the time to read it and appreciate the story that Immaculee has shared. If you've read it before I'd love to know your thoughts. What's on your Summer reading list this year? I'm currently reading The Good Soldiers by David Finkel. If you love to read as much as I do, let's be friends on Goodreads - follow me here. Amy from Prayer Wine Chocolate recommended this book to me. Make sure you check out her blog. She's an amazing woman and I'm sure you'll be inspired by her story to adopt her second child. Well if this isn't a powerful and persuasive book review, I don't know what is :) I'm glad that it isn't for religious book lovers only, but this absolutely sounds like something I'd like to pick up--for me and my mom, who loves these kinds of books too. Many thanks for sharing--adding to goodreads now.